How many Metal artists have recorded albums with their mum? To be honest, I can't think of anyone else, so perhaps this is a first from "veteran" Brazilian singer and producer Thiago Bianchi. Bianchi is, in fact, an active member of no less less than three other bands – Karma, Shaman and Noturnall – but here is keen to show his Metal (sic) as a solo artist, with a little help from musical friends, drawn not only from the aforementioned bands, but Megadeth (Kiko Loureiro), Adrenaline Mob (Mike Orlando) and Angra (Edu Falaschi). The mother connection rears its head on 'Woman In Chains', a Tears For Fears cover, through a vocal duet with Maria Odette. 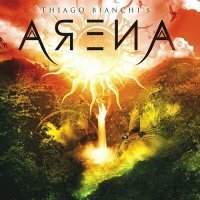 Bianchi may have put together a project that reads like a who's who of Brazilian Metal, and he may be enjoying the freedom that heading up a solo project brings, but with 'Arena' he is also contributing to a very worthy cause, with none of the contributors taking a fee and all proceeds heading the way of children's cancer charities. "This is the least I, and the whole Heavy Metal scene, can do", he says in his sleeve notes "to help and show to the whole world that our work is not only about entertainment but also about love and compassion and solidarity." Fifteen years on the back burner, it was the waiving of fees that finally allowed the project to be completed to Bianchi's satisfaction. His undoubted enthusiasm is infectious, and the album is solid and energetic throughout – strong vocals and classic Metal riffs augmented by warm synths and underpinned by crisp and driving rhythms. I'm not sure it's quite the "rare jewel" Bianchi describes, but it certainly has its moments. Stand outs include the speed and melodic grandeur of 'I Live', the thoughtfully arranged 'Adore' and the beautifully sung 'Hear'. Bianchi is hoping that there will be further Arena albums with an expanding range of contributors. I very much hope so too – it's an excellent showcase for talent that says nothing but good things about the state of Brazilian Metal.